Lemon meringue pie was the first pie I ever made. Edie, my mom’s best friend, taught me how to bake during the summers we spent with her in Copake Lake. She gave me my first cookbook, The Joy Of Cooking. I was so lucky to have her in my life, I loved her. She contracted Alzheimer’s disease when she was in her late 40’s and passed away after a very long time being battled by it. I’ve made what seems like a zillions of pies since then, but the first one was the catalyst. Wherever Edie is, I know she’s thrilled to bits that those first lessons have led to Pie Party Potluck LIVE! 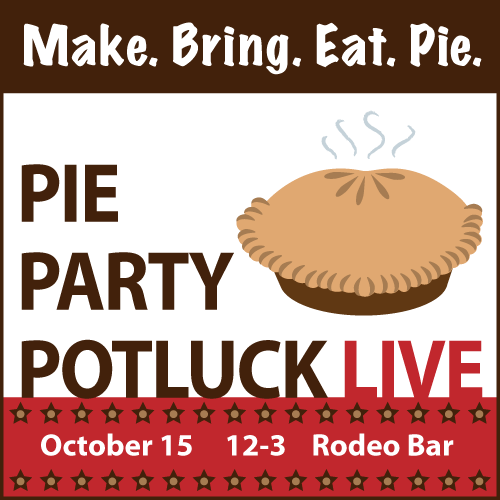 Join food bloggers, food writers, food entrepreneurs, chefs, bakers, restauranteurs, other food biz peeps and pie enthusiasts on October 15th at the Rodeo Bar eating pie!!! Ken and I are so excited to get to hang out with old friends (and eat pie!) and to meet a whole bunch of friends from Twitter, FB and more in real life (and eat pie) and to meet a bunch of new people (and eat pie!). Come share the PIE LOVE! Your choice of a Reci-tee from me, The Diva That Ate New York. Driscoll’s Berries A Month Of Berries! A savory or sweet pie, preferably home-made. Every attendee MUST bring a pie. Pie Party Potluck LIVE! is free. You have to bring a pie and register to attend HERE. Tickets are limited. EVERY attendee must bring a pie, preferably homemade. If you want to bring your partner, your BFF, your dentist, etc., they must bring a pie. You can’t make a bad homemade pie—anything that you labor to make from scratch will be completely appreciated. However, if you bring a pie that you didn’t make, make sure it’s a good one because the pie police will be in attendance. Life is too short to eat bad pie. If you need suggestions of where to buy good pie in NYC email me Jackie at jackiegordon.com or reach out on Twitter. Get our mouths watering. Imagine hearing that someone is making a pie that you will never get to eat. My experience is regret… Now imagine hearing that someone is making a pie that you WILL get to eat. YAY! Make us happy. It’s good for your SEO. Please include a link back to your website or your blog or your recipe or your Twitter or FB page. I will add a running list of what everyone is bringing to this post and tweet it. If you have some pie making info that could be useful to our attendees comment about that too. Don’t worry, if you think you’re going to make one pie and you change your mind, just comment again and I’ll change it. I’m excited for this pie par-tay! I’ll be bringing some variation of s’mores pie—exact construction to be determined! not entirely sure, but they will be mini cup pies using fresh plums and mike’s hot honey spicy and sweet! I’m leaning towards making a spice poached pear tart with vanilla pastry cream and a rosemary shortbread crust. Oh gosh.. what to bring??!! I’m thinking I’ll bring my hazelnut-pear slab pie.. but I’ll let you know if I change my mind.. can. not. wait. I am going through my family cookbook (which my mother made over the course of a year, collecting recipes from both sides of the family, copying each recipe by hand onto four cards - I have 3 siblings - and compiling them in an album for each of us) to decide which pie to bring. Right now, it’s between my great-aunt’s derby pie and my mom’s pumpkin custard pie. I’m bringing my chocolate bourbon pecan pie! I can’t wait! I’m going to bring an Italian Easter pie - the Carzo family calls it pizzakeen - it’s a savory pie. Just signed up for the waitlist w/ EventBrite! If all goes through I’ll bring a Banoffee Pie. Messy and delicious! Thanks for the info! I just signed up for the waitlist w/ EventBrite! If all goes through I’ll bring a Banoffee Pie. Messy and delicious! Thanks for the info! i am either bringing a fig & cheese pie (if there are still figs…) or a pear and lavender pie. or maybe something else entirely. very excited!! Now that the derby pie is off the table (so to speak), I’m considering Heavenly Pie (meringue crust with lemon filling). I will be bringing a Thai-inspired Keffir Lime Meringue Pie with caramelized ginger Graham cracker crust. My CSA dictateth what I cook, so it’s likely going to involve apples. I’m thinking maybe an Apple Cheddar Crostata. I’m planning on bringing a Apple Bacon Streusel Pie! But I’m thinking about bringing a second pie as well. I’ll keep you up to date. SUCH a great list of pies…I’m thinking maybe a chocolate ganache caramel tart OR a mozzarella tomato pie. Oh cruel, cruel… can you even begin to imagine how badly I want to be there? I’d even bring two pies! No, three! Lucky all of you for being in such a great city where so many food blogging friends live! One day…. So, I’m stuck with what I’m going to bring, but I’ve narrowed it down… I might bring Homemade Samosas & Chutneys, a Wild Blueberry Pie, or a Sky-High Apple & Blackberry Pie. I’m going to make pumpkin pie. May give it a bit of a twist yet or may go traditional. It’ll be sweet not savory. I will be bringing a Pumpkin Pecan Bourbon Pie!!! This is for me and Larry Garland. You really don’t want to eat a pie that Larry bakes, so I’ll be making a lemon icebox pie and some chicken empanadas. This is gonna be a hoot! I can’t wait. I’ve got 2 pints of cherries I preserved in brandy this summer and I think they need a home, so as of this moment, I am bring a boozy cherry pie. ok - no longer waiting - cleaning my inbox and committing! Chess pie it is! I am bringing autumn fruit hand pies. Can’t wait. I’m bringing a Salted Caramel Pie! Would it also be possible to bring my husband (who in turn would bring a Lemon Tang pie)? I’ll be bringing chicken pot pie! I’m still debating, but I think it’s going to be a savory lemon, spinach, ricotta pie. I am going with an almond joy pie (sweet)! So excited! Y’all have a great time with pies! I’m with you in pie spirit. Ahh Chris YOU and Karen will be very much missed tomorrow. How fabulous is this list of pies?!!!!!! Slight change of plan on my pie: making a boozy black raspberry- sour cherry jalousie instead of the plain old boozy cherry pie. See you tomorrow!! The commenting period has expired for this post.